THE VISION OF THE WORLD TRADE CENTER collapse needs no rehash. For its horror burned itself into the retina of American souls. So vivid, so shocking, so surreal that its afterimage appears with every blink of our collective eye; an image that will never fade to forgotten. 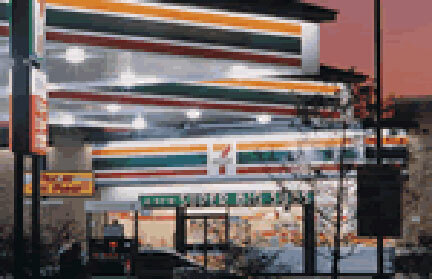 Hence America's twenty-four hours a day, seven days a week obsession with 9-11, our 7-Eleven convenience store where we have shopped non-stop with no "til we drop" in sight. Oh, how we Americans can grieve for our fallen victims. So hurt and outraged are we over our "innocents" dying that we not merely swallow, but swill, such vile drivel as President Bush's contention that what happened on September 11, 2001 was because fanatical Muslims hate us for our freedom. Beyond absurd, this "analysis" is pathetic. The kind of nonsense that lead nations into war. And, by God, America has indeed initiated its war against terror. American patriots from NYC to LA have puffed up their chests and voluntarily enlisted in this march for revenge. These are the same Americans who hate their fellows from the next town over for being outsiders. Or, perhaps, a next door neighbor for the color of their skin. True patriots. Demanding Arab blood to go along with our penchant for cheap Arab oil. True Americans yammering for the rescission of Constitutional guarantees of the very freedoms Bush claims is why the bad evildoers hate us in the first place. Nevermind that in every news story dealing with Palestinian/Israeli situation (read illegal occupation), the Palestinians are always portrayed as suicide bombers/terrorists while poor little lonely democracy Israel is always retaliating. Forget that nearly every mainstream news story contains the adjective "suspected" when describing Palestinian victims of Israeli murderous terrorism. Think about it: suspicion as grounds for annihilation. Nevermind that half a world (50%) starves while Americans (5%) consume up to half the world's available food. Nevermind that US political chicanery vis a vis CIA-supported coups and destabilization activities over decades has severely impacted, in a very negative way, billions of human lives. Nevermind that Saddem Hussain was aided and abetted by the United States in his war against Iran (even as the US aided and abetted the Iranian leadership's war against Iraq). Nevermind that Iraq had exhausted every avenue of diplomatic overture over the course of years demanding Kuwait stop their "slant drilling" operations that essentially thieved Iraqi oil. Hussain said "enough" and moved unilaterally to stop this theft, thus precipitating the Persian Gulf War. Nevermind that the former Bush Administration hyped over and over until Iraq as sixth largest military in the world became a mantra that lulled a world into believing it was a threat. Nevermind that the war drums beat for months of US and coalition military buildup to whip up mass approval for mass murder; a war that would last approximately six hours. Six hours! We all knew these facts... They have been there all along. Even if all we read or viewed was mainstream news, the clues were/are/have always been there for those whom think and not simply absorb. Oblivious? Not a defense. Americans are guilty. There are no innocents among us. "In other words, world leaders continue to use distortions of reality to create among their people a belief in scenarios that are not real. These leaders then offer solutions to the various symptomatic scenarios they created while truly problematic conditions go unaddressed. "But illusions of grandeur fail miserably when tested with the realities of poverty, disease, hunger, displacement, hopelessness; conditions that drain the spirit from the souls of most humans; conditions that are the breeding grounds for terrorists. "Those that enjoy the fruits of such perceptual deceit, rather than question the illusions promulgated by governmental leaders, blame the downtrodden for causing their own misery. This being the case, with such disparity between the minority haves and majority have nots, between reality and the perceptions thereof, terrorism as a means to an end -- gaining equality -- will intensify in every nation. So, too will the government-created delusions of omnipresent terrorists being a 'vile horde' worthy of extinction become more prevalent, to further the strategy of rescinding personal freedom.